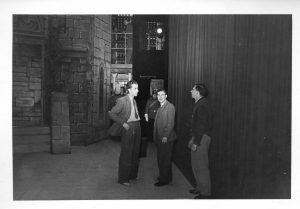 During WWII the ‘authorities’ positively encouraged amateur dramatic activities as a way of providing entertainment to workers in many industries. The staff at TRE took on this challenge with great enthusiasm and several diverse groups were established. The Pylon Players considered themselves the ‘elite’ group and specialised in play readings. 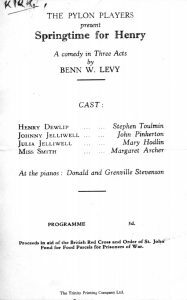 Their first performance of three one-act plays; The Man in the Bowler Hat (A A Milne), Royal Flush (A H Ratcliffe) and Hands across the Sea (Noel Coward) took place on 3rd September 1942 in the York Hall at Malvern Girls College. The Chief Superintendent A P Rowe was the “Man in the Bowler Hat”. Unfortunately the Headmistress was most unimpressed and vowed never to let out her hall again to TRE. After this the ‘players’ retreated somewhat and concentrated of entertaining their own members with readings of The Cherry Orchard and similar material. Their next public performance was in August 1943 at The Firs Nursing Home which served as the TRE Sick Quarters. 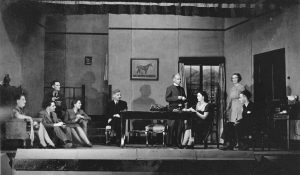 The final performance of ‘Private Lives’ took place at Geraldine Hostel in September 1944. The Zenith Players also concentrated on traditional material with their first performance being ‘Why Not Tonight’ by C Stafford Dickens in September 1944. Later performances included ‘Tobias and the Angel’ in December 1945 at the TRE Assembly Hall. Check out the dodgy looking beard. The Flying Rockets were by far the most successful group and somewhat ‘low brow’ in comparison with the other groups. Their founder was Eric Kirk and they wrote all their own material in the Gang Show style of the day. Douglas Mayer was responsible for much of the writing. They were in great demand and made many public performances as far away as Colwall, Newent and Grimley. However they were not universally popular; the Chief Superintendent noted in December 1944 that: “The standard of performances at TRE was low and that no provision was made for entertaining the large number of people with high powers of appreciation of artistic matters.” Further, he felt responsible for educating people to appreciate entertainment of higher artistic merit. He felt that the standard of both films and shows at TRE could be raised and that a higher standard should be aimed for at least half of the time. 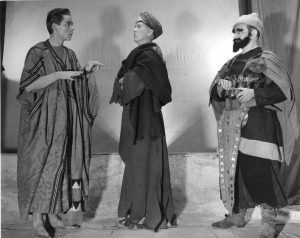 The Piers Plowman Players also known as the Hollyrood Players staged production at venues such as the Piers Plowman Club, Geraldine Hostel and the Pale Manor site. 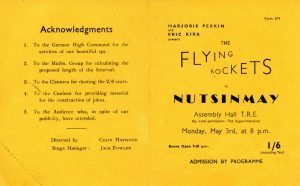 In April 1946 the Pylon Players, Zenith Players, RAF Dramatic Society and Flying Rockets merged to form the TRE Theatrical Society and quickly became established as a very technically accomplished group of performers. 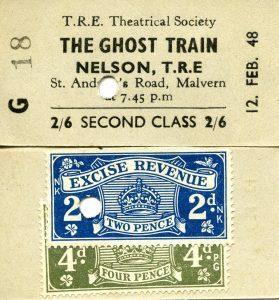 The 1948 performance of ‘The Ghost Train’ received excellent reviews in the Malvern Gazette. That looks suspiciously like Sid Widdows behind the moustache. 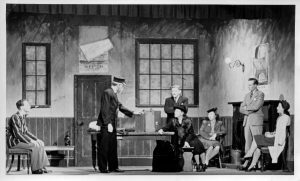 TRETS changed name to the Nelson Players in April 1955 and continued to great acclaim. 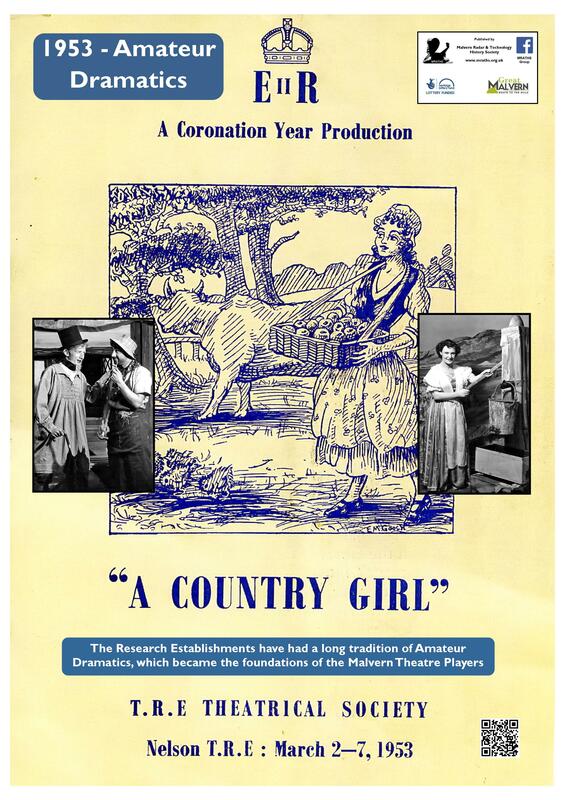 In 1977 they took the difficult decision to leave Nelson Hall and under the name Malvern Theatre Players became the resident amateur company at Malvern Festival Theatre. 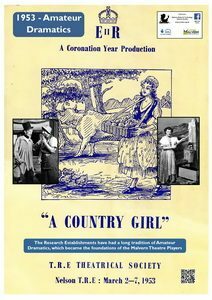 They continue performing to this day and now have their own Coach House Theatre in the centre of Malvern.